Pte. David Horne, photo taken in India. 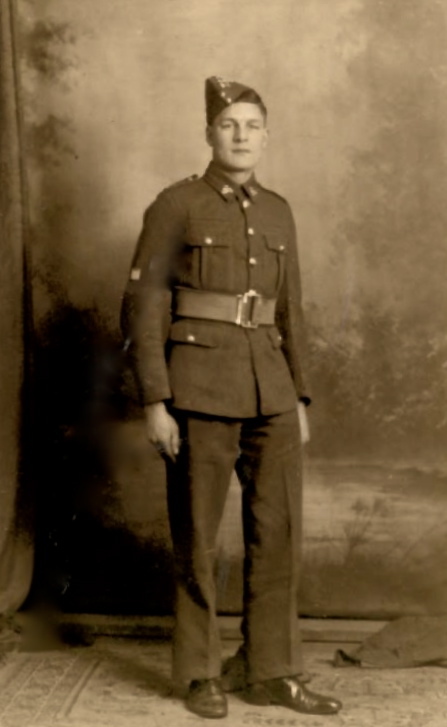 On the 7th November 2014, I was very fortunate to receive an email contact on my website from the grandson of Pte. David Horne, a member of the 142 Commando Platoon from Chindit Column 8. Steve, I think the D. Horne you mention in your Jim Tomlinson article was my Grandad, Dave Horne. I still have his slouch hat which he proudly wore every Remembrance Day as he played his bugle at our Cenotaph. Interestingly, although I understood he was originally from the Royal Berkshire Regiment (coming from the south), he himself stitched 'King's' (Liverpool) in place of the Berkshire's badge, as that was where he ended up, and in his own words, he felt he was "the only one left" from the battalion. He didn't speak much about the war. I think he still felt sad about his mates that did not make it back, but it was clear that he had been through some amazing expeirences. I repled to Peter's initial email, mentioning that it was very common for the men returning from Burma not to speak of their experiences with their families. This was partly to protect their loved ones from knowing the truth about the horrors these veterans had witnessed, but also an attempt to try to forget those times themselves. 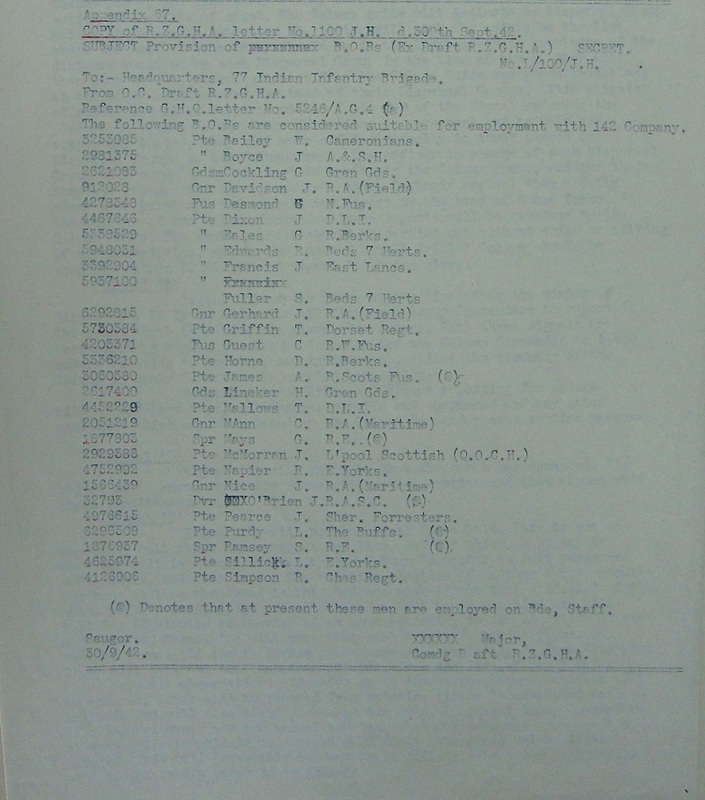 I also remarked upon the fact, that there had been a lot of 142 Commando activity on the website around the time that Peter had made contact, and that he had been the last of six family enquiries about men from this unit. The photograph seen to the left shows David Horne in his 6 Commando uniform and beret, this was taken shortly after his commando training. 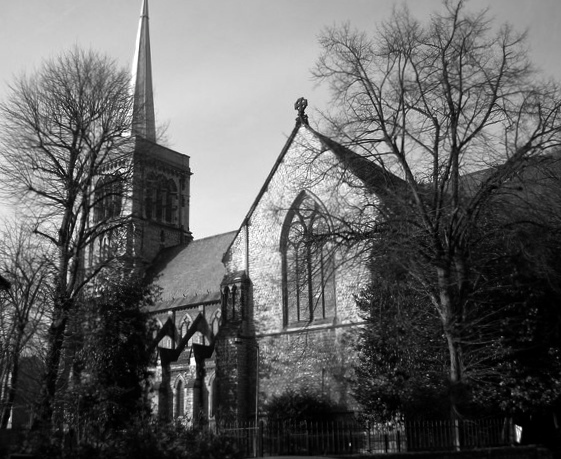 David Horne was born in 1921 and lived most of his early life in Hackney, situated in the Northeast corner of London. Granddad was a pretty fearless character, enjoying hobbies such as speedway riding before the war broke out in 1939. My own Dad told me that Granddad was part of team of commandos that kayaked into a French port to attach mines to enemy ships. My Granddad also told me that some of his commando training took place in the Lake District and that they were billeted at Ulverston in a large house called Todbusk, later this became a sixth-form college where coincidently I ended up studying. It was here that he met my Grandmother Pamela, who came from Barrow-in-Furness. Discovering that David had previously served with No. 6 Commando made perfect sense to me, as this unit had been raised on the 23rd June 1940 under the command of Lieut-Colonel T. Featherstonehaugh of the King's Royal Rifles. This officer would go on to lead 142 Commando in its first moments as an active force just two years later in India. During the invasion threat to Great Britain in 1940, No.6 Commando moved first to Romney Marshes in Kent and then were based at Brightlingsea in Essex. 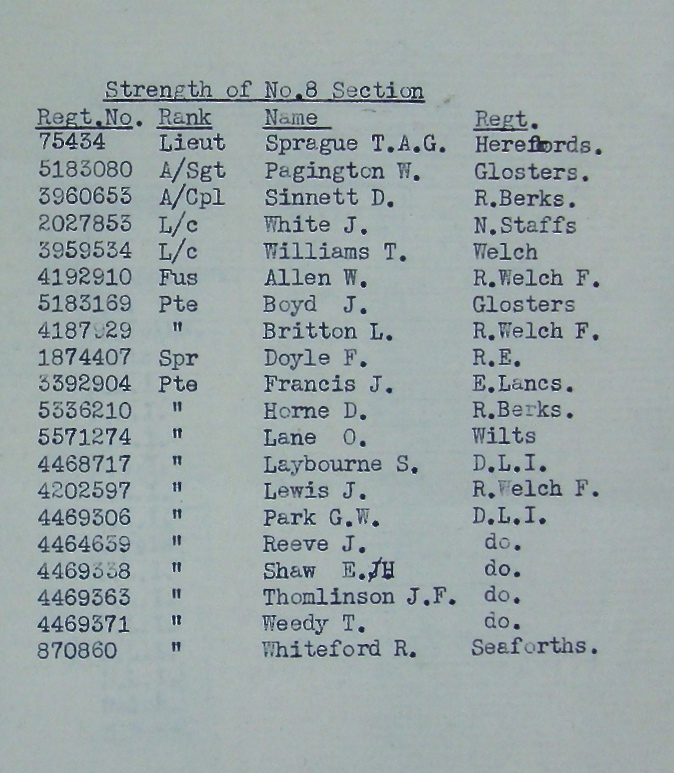 Later the unit was posted to Bristol for Landing Craft training before travelling finally to Milford Haven in Wales. 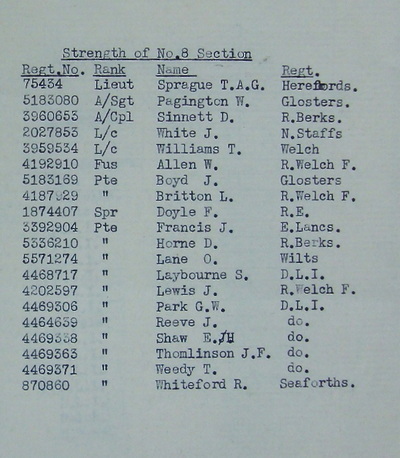 As with all the other commando units, No.6 was absorbed into the Special Service Brigade for a period, before being re-designated as No.6 Commando once more in late 1941. In November 1941, No. 6 Commando in partnership with No. 12 Army Commando were chosen for 'Operation Kitbag' an attack on the Norwegian coastal town of Floro. Unfortuantely, this operation was subsequently aborted. It must have been shortly after this time that Pte. Horne left No. 6 Commando and travelled overseas. 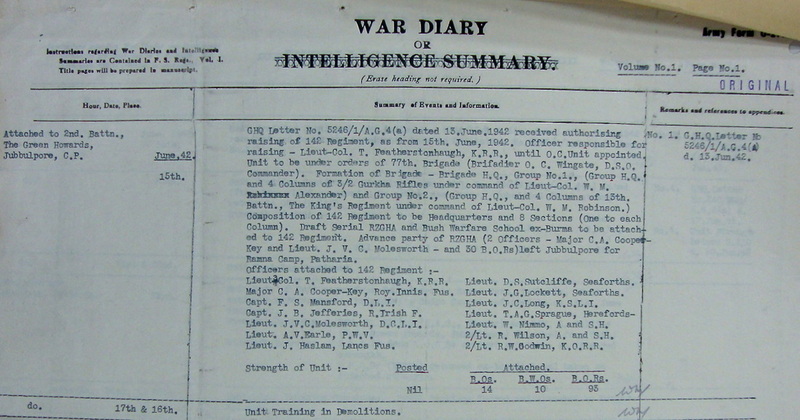 By June 1942, Lieut-Colonel Featherstonehaugh (sometimes written as Fetherstonhaugh) was present at Jubbulpore in India and was preparing to raise the strength of a new commando unit. In the first instance the numbers for 142 Commando came from men who had served in the Middle East. It is not known if David Horne came to 142 via this route. 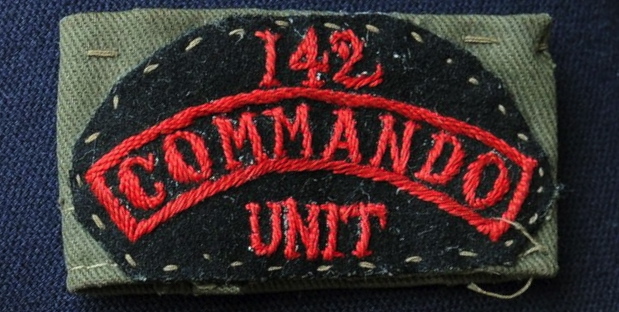 On July 13th 1942, command of 142 Commando was given over to Major Mike Calvert of the Royal Engineers. The unit was supplemented by soldiers from the Bush Warfare School at Maymyo and the 204 Chinese Military Mission. 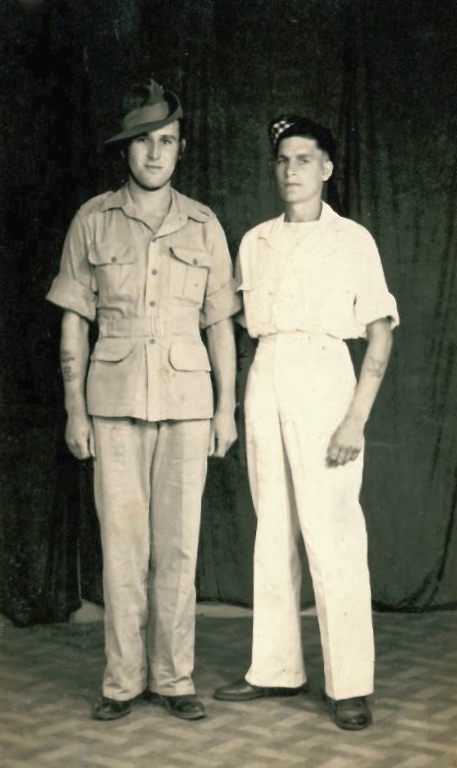 Both these former units had experience in Special Forces operations behind enemy lines and had only recently exited Burma or the Yunnan Provinces of China. 142 Commando had also moved to their new Chindit training camp at Saugor in the Central Provinces of India. 1 Commanding Officer, usually a Lieutenant promoted to Acting/Captain. 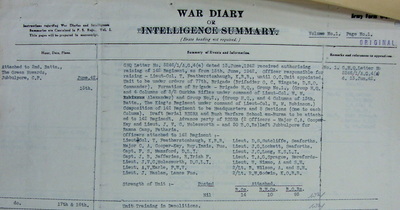 From the pages of the 142 Commando war diary for 1942 I found that Pte. 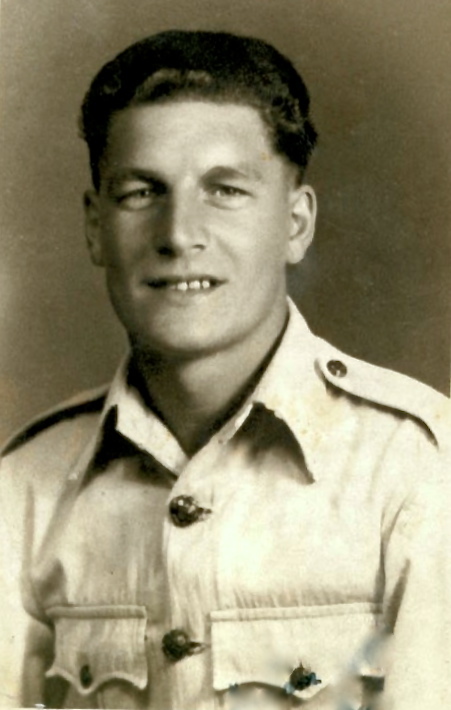 David Horne had been posted to the unit on the 30th September and had been placed into the Commando Platoon for Chindit Column 8. For more information about his time in Burma, please follow the link below which tells the story of his comrades in the 142 Commando Platoon for Column 8. Seen below are some images in relation to David Horne and his time in 142 Commando. Please click on any image to bring it forward on the page. As you will have read from the story of Jim Tomlinson and Column 8 Commando, David Horne was one of the few men to survive Operation Longcloth from that unit in 1943. After making the journey back to India, he would have been admitted to hospital (probably at Imphal) where he and the other survivors were treated for malnutrition and any tropical diseases they had contracted. Most men were then sent on leave, usually to one of the hill stations in Assam. After this leave, men from the 13th King's re-joined the full battalion who were now stationed at the Napier Barracks in Karachi. 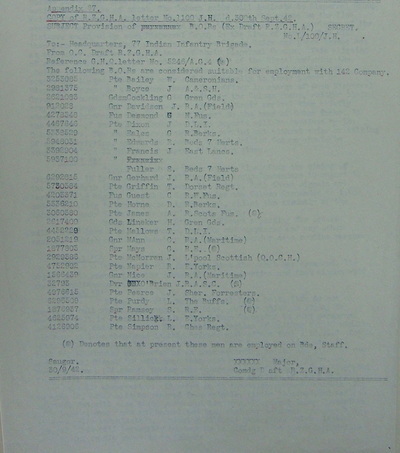 The King's remained here for the rest of the war, but some of the battalion volunteered to make up the numbers of the new 15th (Kings) Paratroop Battalion in early 1945. It is not known if David served with this unit, but it seems more likely to me that he remained with the 13th King's proper at Karachi. Seen below are some more photographs in relation to Pte. David Horne and his time in India and Burma. Please click on any image to bring it forward on the page. 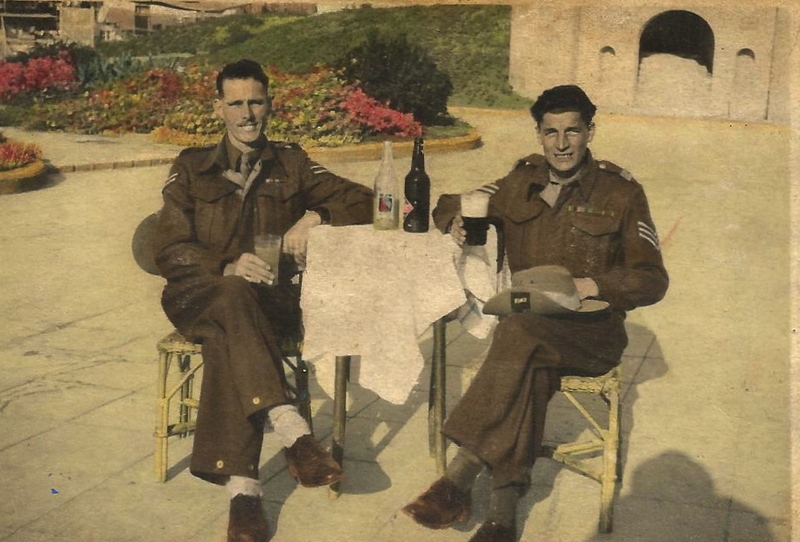 I have sent over a file which has two photos on it, one is of my Granddad in October 1945 having a beer with a friend in Tel Aviv during his transit home to UK. 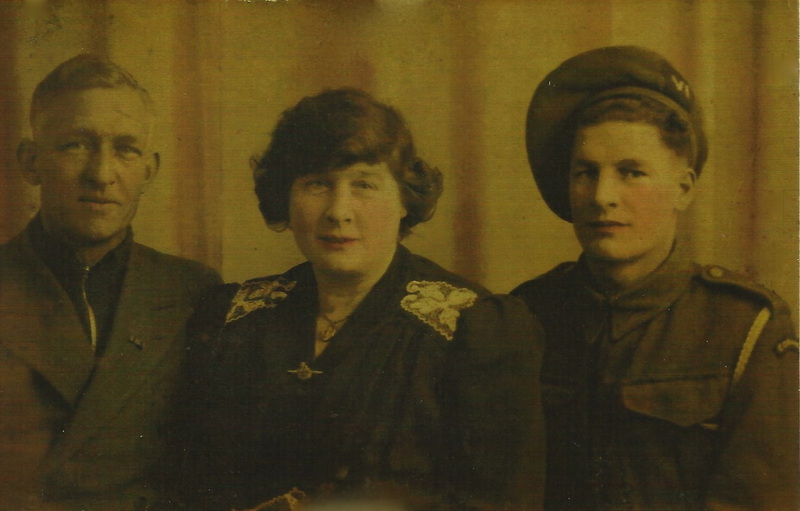 I inherited the hat he has on his knee and one of the two bugles that he brought home; I noticed that by the time this photo was taken Granddad had become a Sergeant. NB. I have known of several Chindits that passed through Tel Aviv on their way back home to Britain. It is my understanding that this normally meant that the soldier had flown back by plane, rather than taking up the slower option by troopship. However, with the Suez Canal, by this time re-opened for shipping, it is not impossible that some troopships may have docked on the Israeli coastline as a break in the journey home, although this does seems unlikely. 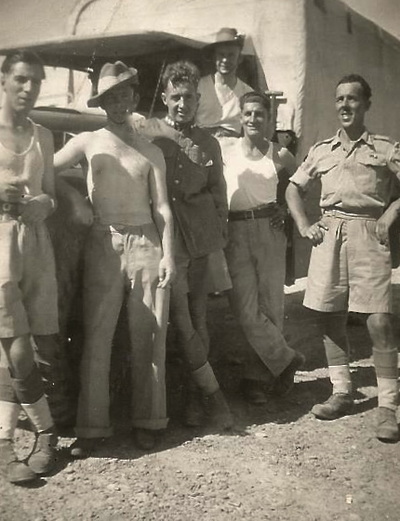 The other photograph appears to be with some mates, standing next to a truck possibly in Burma or India. David is second from the right in the very white vest; I wonder if the other men in this photo are referred to somewhere on your website? After the war my Granddad became a postman in Hackney; he stayed with the Post Office until he retired, ultimately being in charge of the Mount Pleasant sorting office in Islington. My grandparents lived next door to St. John of Jerusalem Church in Hackney, where Granddad was also the Church Warden. I have many happy memories of him just being busy fixing and taking care of things in the church. I cannot ever remember him just lazing around, he was always working. Upon retirement in the mid-1980s, my grandparents moved north to Barrow, living in the old railwayman's cottage that my Grandmother had been brought up in. My own parents (and myself) had moved North in the late sixties. Granddad died in 1999, but had enjoyed a full and good life. He was an unassuming man with the courage of a lion, I guess we are always reminded of him on Remembrance Day when he would always wear his hat and medals and play the last post on his bugle at the memorial service in Barrow Park. A recent email from grandson Peter Horne has enabled me to add some more images to this story. I have added four more images to the gallery above. These include scans of Pte. David Horne's certificate of participation on Operation Longcloth. There are several other examples of this certificate shown on my website and in general they seem to have been awarded to men who served with Column 8 in 1943. 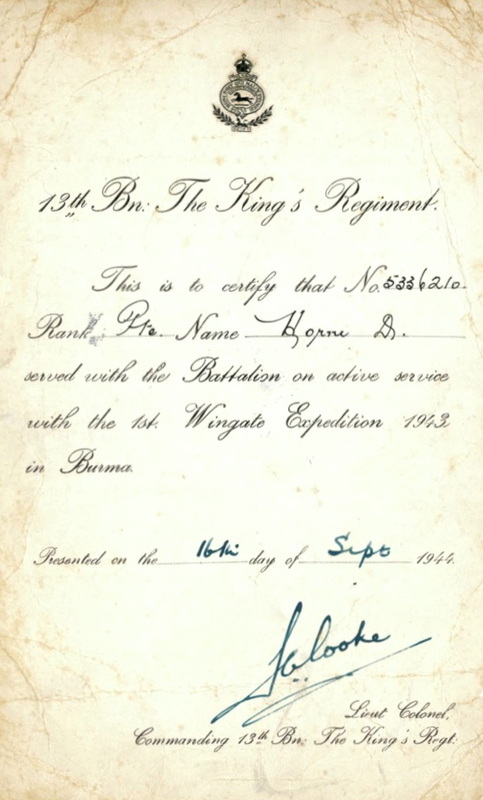 The certificate is signed by the senior officer of the 13th King's that year, Lieutenant-Colonel S.A. Cooke. Also shown are two other photographs of David: one from early on in the war and judging by the cap badge, from his days with the Royal Berkshire's. The other photo is from 1944 and was taken after his return from Operation Longcloth, on the back of is written 'Good luck David' and is signed 'Leslie Waters', Karachi 1944. 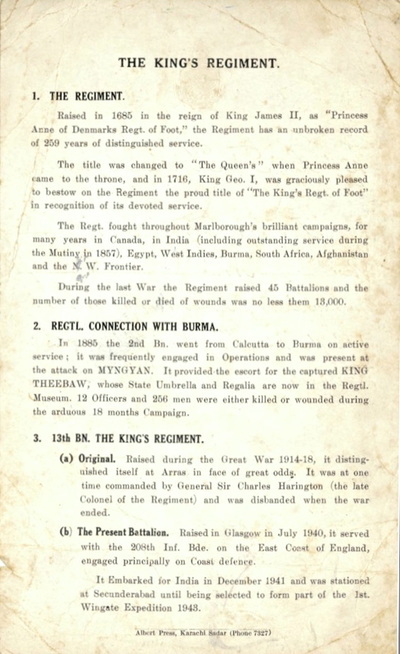 The 13th King's were stationed at the Napier Barracks in Karachi after their recuperation period post Longcloth. Peter told me: "I am not really sure about my Granddad's white uniform in this photograph, although I recall him telling me that he was assigned to the Black Watch Regiment for a while, this may account for the Glengarry." Perhaps the most significant image sent by Peter is the group photograph seen below. This shows David Horne (seated centre) with some of his 142 Commando comrades from Column 8, and therefore must have been taken pre-February 1943. On the back of the photograph are written the following names: Tommy Weedy, Bill Parks, Eddie Shaw, Bill Reeves, Regy Gordines and David Horne. NB. By cross-referencing Reginald Gordines against my Chindit files, I now believe that this man is in fact Pte. 4464935 R. H. Cordiner, formerly of the Durham Light Infantry before being posted to 142 Commando of 77th Brigade in 1942. 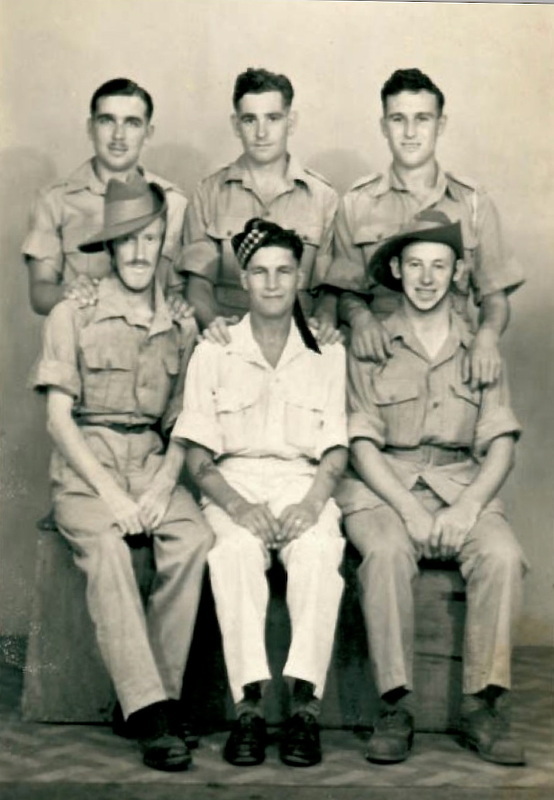 David Horne (seated centre) and 142 Commando comrades: Thomas Weedy, George William Parks, Eddie Shaw, Bill (James) Reeve and Regy Gordines. Copyright © Steve Fogden, December 2014-15.